If I learned anything in this past week, it's that there really isn't any such thing as a "biker friendly city". Even when a city's Chief of Police claims to be a biker, who has aftermarket exhaust on his motorcycle, and even sings the praises of "loud pipes save lives", it doesn't mean it will trickle down to the cops on the streets. Apparently, merchants there claim to all be "biker friendly", but whatever the case may be, somehow things got out of hand over the past year, and cops were going on a feeding frenzy busting motorcyclists so frequently, that the city had begun building a reputation across the Southern California biker community that it didn't want them around. Perhaps more correctly, there was little oversight, or maybe, little concern on behalf of the Chief of Police. I actually spoke with the guy over the phone, who assured me (after I told him that I publish a biker news blog with about 30,000 readers per month) that he gave new instructions to his officers to leave motorcyclists alone. Or that is, "use more discretion" before pulling them over. What started out as an attempt simply to ticket those few bikers who were accelerating too hard from a stop, or revving their engines, or purposely "blipping" their throttles to set off car alarms, got out of control with officers "ganging up" to corral whole groups of bikers, pull them all over at once, and then find something to cite each. The cited bikers were actually told by these officers, that they were not welcome in Temecula. The Chief of Police said to me that he looks at the tickets cited on a regular basis, and one time saw that there were 60 motorcycles cited over a period of three consecutive weekends, for violations of non-DOT helmet, and aftermarket exhaust. Those were two violations that he specifically didn't want riders being cited for. He actually admitted that his officers did not adhere to his orders. But if that's the case, he could have done something right away to stop the carnage. Apparently, he didn't. It wasn't until two local businesses witnessed cops executing one of those "fishing net" style biker busts, that got them angry enough to put a stop to it. They contacted the Chief of Police, the City Council, and the City Manager and pressed their case with them. Eventualy the Chief of Police paid a visit to them both, and assured them that starting now things will change for the better. So when I called the Chief of Police, just to verify what those two business owners told me, he in fact sounded very genuine and believable. But I still can't imagine why he didn't step in to correct the situation before hand, and instead wait for local businesses to complain. He told me, "I'm a motorcycle rider, I own a Harley. I have aftermarket exhaust too, and I believe that loud pipes save lives", he told me. "I don't want to scare away bikers from Temecula, I want to make them feel welcome. I just want to go after the ones showing themselves off as being obnoxious". 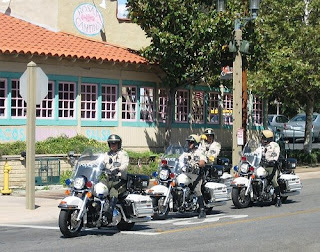 So being that I frequent those two businesses a lot, and wanted to help them succeed in putting a stop to the ticketing madness, I told the Chief of Police that I'd publish something on Biker News Online to help repair the city's damaged reputation. I'm counting on that Chief of Police to follow through on his word that he'll keep his officers under control. The bottom line is that there really isn't any such thing as a "biker friendly city". Just because a town attracts a lot of motorcyclists, is not any kind of sign that the city goes out of its way to embrace them. I'm not sure what exactly is going to happen with Motorcycling as this economy continues to worsen. On one end, people are spending less money on luxuries, but on the other end, motorcycles and scooters are still very inexpensive to operate. So maybe while people won't be buying up new motorcycles, or new chrome, they'll still find riding a motorcycle very economical. One of my good friends and I were chatting last night at Happy Hour and commented how the bar was so sparse with customers. "At this time, there would be a line to get into this place", he said. But instead, there were plenty of seats and tables open. That seems to be on par with a lot of establishments around here. I've noticed that The Hideout, Hells Kitchen, and Cook's Corner, all well known biker bars around here, have low turn outs lately. I don't know if it's that people are not riding their motorcycles, or if people are only riding them when necessary, like commuting to work, or running errands. As for my friend, he's trying to supplement his income with another job. He hasn't found one, but is looking. There are just no jobs around here. He knows that I publish websites and blogs for a living, and asked me to help him launch one. I agreed, but he said he'd like to write about his travels by motorcycle, the roads he rides, the bars and restaurants he goes to. I thought to myself, "Hmmm, there's hundreds of those blogs out there already". But I suppose there's room for another one. Both he and I have managed to pare our lifestyles down, making them more simple. For myself, I work, and then I ride. I've dumped the other hobbies and committments that took up more of my money. My friend has grandkids however. He has to buy them birthday gifts, and take them out to places. Of course, being a grandpa will take precedence over riding a motorcycle, so it might be that this economy will have him riding less. And if he gets himself another job, he'll have even less time to ride. As a side note, I finally posted a new article on my motorcycle blogging site. I have to admit that I've found myself rather uninspired to keep it up to date. But I am feeling the pinch of this economy, and maybe, just maybe, there's more bikers out there thinking of starting a blog.